Over the years I’ve seen many athletes not achieve their full potential in races because they failed to execute a proper IRONMAN taper. I’ve witnessed triathletes who have not backed off enough and were tired and flat at the event; I’ve also seen those who have dialed back their training far too much, and dulled the fitness that they had taken months to hone. 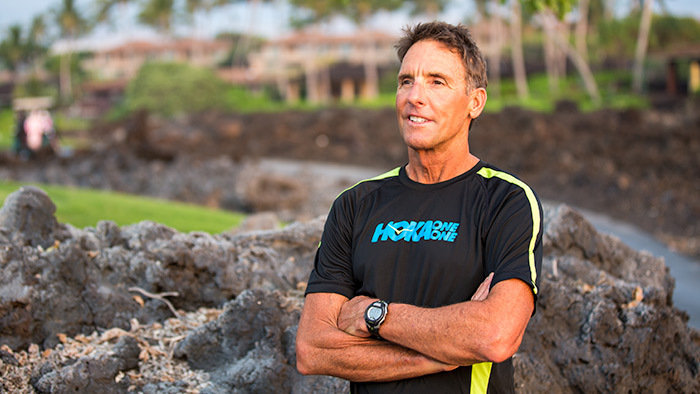 Follow my prescription as we countdown to race day in Kona, and you’ll arrive at the starting line with that perfect mix of expansive aerobic capability and sharp, high-intensity output that will propel you to an optimal performance. While this is written with the IRONMAN World Championship in mind, it will work for any IRONMAN you may be racing. Tapering is an art form, so above all else, listen to your own body. 1. Maintain your schedule. Maintain the same number of training days per week and follow your typical schedule. If you normally run on Tuesdays, then continue to do it! Don’t alter things. 2. Long training days. Your training is nearly complete, and so you should resist “cramming in” your final long workouts too close to the event. If you’re planning a long run, schedule your last one 18 to 22 days before the race. Your last long bike should take place 14 to 21 days from race day. Your long swim: Nine to 10 days prior. 3. Maintain “race-like intensity,” but reduce the segment length of repeats. There is a great physiological return on reducing your sub-threshold and threshold training to between 90 second to 3.5 minutes per repeat. These shorter segments—even with complete recovery—will not leave you whipped after the workout. By resisting the temptation to lengthen the repeats, you’ll maintain the adaptive stress of the session and enhance your day-to-day recovery. An example set is: 3 x 3.5 min + 3 x 90 sec + 3 x 2.5 min + 3 x 90 sec. The rest interval between repeats should be long enough to maintain the desired intensity throughout the workout. 4. Notice improved performance. One characteristic of a proper taper is that you’ll begin to feel a bit fresher during and after the workouts, while experiencing a 2 percent to 5 percent increase in performance (either by comparing tangible measurements or Rate of Perceived Exertion (RPE)). For example, all of your training sessions might feel easier with a concurrent increase in speed, watts or simultaneous reduction in heart rate. Simply, you should begin to feel like you’re flowing at less effort. This sensation is a positive affirmation that your training has been effective and you’re on track for a good race. Additionally, niggling stiffness or sore spots should subside. Acute soreness means you need to rest more or consider a combination of modalities to expedite the recovery (see #8 below). 5. Reduce overall training time. A reduction in total training time should start during this taper block. Looking at weekly training volumes, my suggestion is not to reduce the volumes by a fixed percentage. The problem with this math is that the athletes who train 11 to 14 hours per week (i.e. most age-group athletes with full-time jobs and families) cannot compare themselves with those training 30-35 hours weekly (i.e. professional athletes and elite age group athletes). For those logging 11 to 14 hours per week, reduce your volume by about 15 percent. If you’re typically training 15 to 22 hours, bring the volume down by 20 percent. If you’re at 23 to 30 hours, then reduce that by 25 percent. If you’re training more than 30 hours, then reduce that by 30 percent. These percentage reductions should be reflected in all disciplines, and particularly in your run workouts. The eccentric load of the run slows the recovery process. Also be sure to look at your personal strengths and weaknesses and reduce accordingly. 6. Maintain your mobility, stretching and strength training. Eliminate the heavy lifts or explosive plyometrics, and reduce the weight and number of reps, but maintain your typical routine. Take the exercises to fatigue but never to failure. If you’re on a minimal strength program, continue at least twice per week emphasizing core, gluteal, rotator and back strength, plus maintain joint mobility with foam rolling and stretching. 7. Watch your weight. Your goal is to neither gain weight nor hit your optimum race weight during this time block. Eat nutrient-dense foods with healthy fats and protein at all meals. Cut back on simple carbohydrates. Don’t alter your macronutrient balance. This is not the time to adjust your diet strategy! If you’re madly driven to lose weight during the final 10 days, then keep this weight loss to no more 0.5 percent of your body weight. 8. Continue your bodywork. Maintain treatments with your physical therapist, massage therapist, acupuncturist or yoga routines. These are all good, but don’t try something new during this period! 1. Keep to your schedule. Maintain the same regimen and order of your training, both in terms of days per week and disciplines per day. 2. Reduce your “long” distances. Your longest run should fall on day nine or day 8 before the race, and it should be 35 to 50 percent shorter than the last long run at the start of your taper. For example if you entered the taper with runs at 17 miles, then this long run should now be reduced to 8.5 to 11 miles. Your long bike should be similarly reduced, and your long swim workout reduced by 15 percent. 3. Maintain intensity. Intensity should be maintained up to three days before the race. However, I want you to further reduce the set length. Rather than looking at percentages, it’s easier to maintain “race-like “ intensities in all three. This includes muscular overload, recovery between sets and breathing rates during exertion and recovery. The key is short sets of between four and 12 minutes, and short segments of 30 to 90 seconds. Lastly, maintain the steady-state aerobic work, particularly on the bike. This allows you to finish these sessions with elevated endorphins, which will help to maintain calmness during this period. I always had to feel my endorphin buzz or I’d go crazy leading up to the race; I’d workout just enough to take off the edge and allow myself to sleep. 4. Sleep. Get more if you can, and start shifting your bedtime hours or minutes a bit earlier so that the night before the race it’s “lights out” at about 8:30 p.m.
5. Dinner. Begin shifting your dinnertime so that—on the last two nights before the event—you’re comfortable with finishing dinner by 6 p.m. This will give you a 10-hour stomach transit time before your early wake-up call on race morning. 6. Maintain strength training. Right up through Wednesday of race week – several days before the start, keep to your routines. Reduce the weight and just do one or two sets of all exercises. Maintain stretching and your foam rolling routines. 7. Dial down the alcohol. Eat right and reduce your alcohol consumption. If you like a glass of wine or beer with the evening meal, have no more than two per day. 8. Watch your weight. Don’t overeat due to nervousness. 1. Shorten the workouts, but maintain intensity. Maintain session intensity at the same levels you’ve been training. Breathe hard, make your muscles work and remind yourself of the physical cues that allow you to flow. A set of 6 x 2.5 minutes on the bike at race pace would be perfect! A run at 8 x 30 to 45 seconds at your IRONMAN 70.3 pace would be just right. For your swim, 12 x 75 meters at race pace. Add a steady-state aerobic block onto the end of each session to complete the workout. 2. Strength training. Conduct your final strength session on either the fifth or fourth day before the race. 3. Bodywork. Relax with a massage, PT or yoga. 4. Verbal cues for the race. Write down the key phrases that allow you to sense the easiness when you’re racing in each discipline. Consider these to be your mantras or cues. Swim – relaxed arms, wiggle your fingers in the recovery, firm catch. Bike – perfect circles with a softness yet solid stroke at the bottom. Long through the lower torso and draw the belly in to engage the core. Look at your leg muscles while they’re pumping down the Queen K and see yourself on your last great ride at home. Run – light but firm hold on ground contact. No wobbling from side to side. Maintain a relaxed face, head, neck, etc. 5. Practice visualization. Visualize a mental roadmap of the course. For all three disciplines, know the turns, the tough spots and how YOU are going to break-up the course. 1. Workouts. You can still work hard in your sessions but keep them very short and allow them to leave you a bit antsy to test yourself. 2. Go Easy. Get out of the mid-day sun. Exercise in the morning. Try to swim on the racecourse, if possible. 3. Don’t Overdo the Hydration! Stay hydrated but DON’T over drink water or electrolyte drinks. Keep your feet elevated, minimize your time at the expo and walking around downtown, no matter how tempting it may be to relieve race nerves. 4. Think through your race strategy. Anticipate the inevitable tough patches you’ll experience during the race, and think about how you’ll work through them. Do all three disciplines and get a light sweat on the bike. Mix up your strokes on the swim. It’s okay to make a handful of efforts at almost race pace, but don’t overdo it! Wake up your legs for 30 seconds and know that tomorrow the snap will be there. You’ve made it. You’ve put in all the hard work, while still allowing your body to rest and prepare for a hard but worthwhile race day. Good luck!